Not many patients qualify for medical marijuana under the current system in New Zealand, which has led many patients in need of cannabis meds to purchase marijuana on the streets illegally. It’s estimated that one in 20 people in New Zealand are using cannabis for medical purposes. Because of this obvious need, lawmakers have introduced a new bill to Parliament that would create a more inclusive legal medical marijuana program. The Misuse of Drugs (Medicinal Cannabis) Amendment Bill was introduced in the New Zealand Parliament in December 2017. Although it’s still new, it’s expected to pass. However, it will most likely take about two years to implement. In the meantime, patients will have to follow the current criteria for cannabis-based medications. New Zealand’s Ministry of Health began allowing physicians to prescribe certain cannabis-based medications in 2016. Thus far, the only approved medications are Sativex and CBD. Although doctors can prescribe CBD products for any condition they believe the medications will help, Sativex is a bit more closely monitored and can only be prescribed to patients with multiple sclerosis. However, patients can apply to New Zealand’s medicines regulatory agency, Medsafe, if they feel Sativex would help them. The New Zealand government does allow specialists who believe cannabis medications would help their patient to apply to the Ministry of Health for special permission to import these kinds of meds. Unfortunately, all applications have been denied so far. The new program would give more patients access to safe, affordable medical marijuana. However, it will take the government some time to develop the criteria and implement it. Like many countries, New Zealand doesn’t have a medical marijuana program, per se. Instead, they allow physicians to prescribe approved cannabis-based medications. However, when the new law is adopted, it will bring about many changes to what a patient must do to gain access to medical marijuana. Even though the new system will give more patients the opportunity to receive cannabis, there will still be strict guidelines. As the new bill makes its way through Parliament, a Medicinal Cannabis Advisory Committee will form to hash out the details of the program. The committee will be made up experts, such as doctors and pharmacists, as well as consumers and other individuals who can advise the government on how to best streamline the medical marijuana program. The new program still makes it illegal for patients to access their own cannabis-based products. Even approved medications, like CBD meds and Sativex, must be sourced from their physician. This can be quite pricey, as patients are required to pay all or most of the sum out of pocket. However, the system will make it easier for patients to afford and access medical marijuana. Also, the government intends to initiate a domestic cannabis industry, which will produce safe and effective medical marijuana within New Zealand. 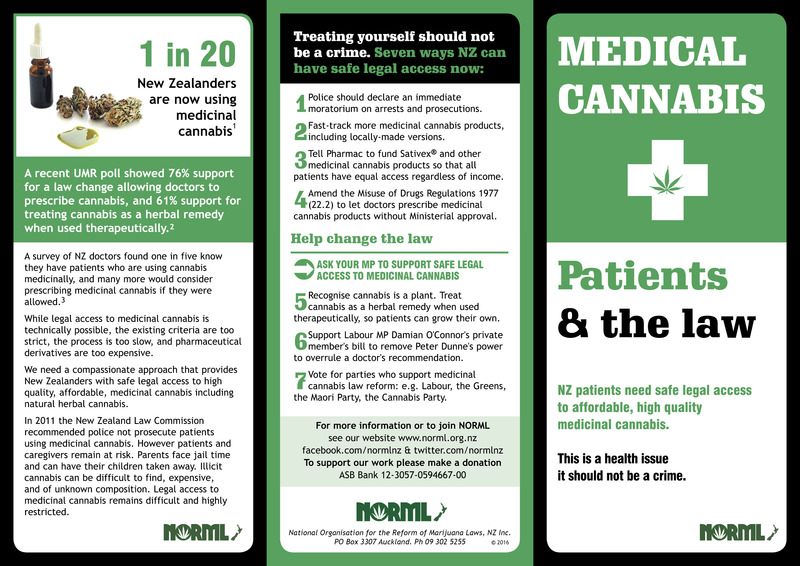 There is no legal protection for medical marijuana patients in New Zealand. Those who take Sativex and CBD medications will not be persecuted as long as they have their doctor’s prescription, but many patients throughout the country obtain medicinal cannabis through illegal means. These patients are subject to all penalties under the Misuse of Drugs Act 1975, including the possibility of jail time and a fine. Some police officers will be lenient to patients caught in possession of marijuana, but this is not a sure thing. One of the first changes to be implemented when the Misuse of Drugs (Medicinal Cannabis) Amendment Bill passes will be decriminalizing the use of cannabis for patients with terminal illnesses who have less than two years to live. Attitudes toward cannabis are changing all over the world — New Zealand isn’t the only country introducing new medical marijuana legislation. You can learn more about international cannabis laws right here at MarijuanaDoctors.com. We strive to connect patients to useful information, so check out our resources and blog today.